Vacation rental cabin / bungalow. Sleeps 18, 5 bedrooms, 3.5 bathrooms. No pets allowed. 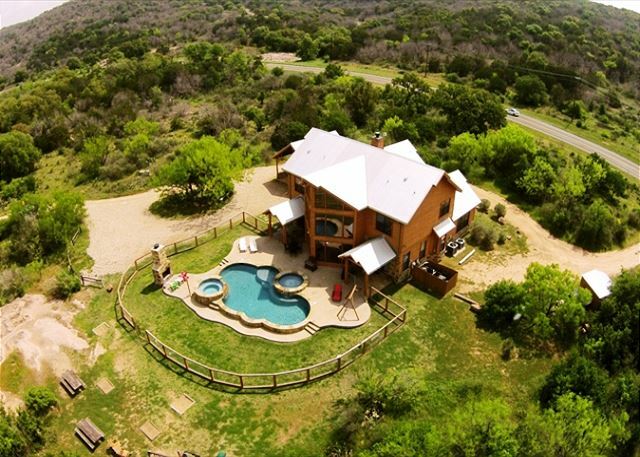 This unique home is finished with cedar. The five bedroom home has the master bedroom and private bath on the ground floor. This room has a king bed and an outside door leading to a small patio area off the pool. An open concept floor plan gives you plenty of room to enjoy each other's company. The kitchen has a convenient island situated among the L-shaped cabinets and semi-circle bar. The 2 refrigerators and double oven make preparing food for a crowd of 17 an easy chore. Plenty of dishes, flatware and cooking utensils are available. A beautiful dining room set offers seating for 8. Additional seating is available at the small game table in the living area and bar stools at the bar. Completing the living area is a beautifully designed propane fireplace. Rows of large windows stretch down from the roof peak giving wonderful views of the pool area and grounds. Down the hallway you'll find a 1/2 bath, utility room furnished with a washer and dryer and a game room. A ping pong table is front and center in the large game room with nooks for playing checkers or card games. A bistro-type table and futon round out the furnishings. Upstairs is U-shaped with 2 bedroom on each side and the loft at the bottom of U. Two bedrooms on each side share a full bath. All the bedrooms have a king bed. The loft has 2 sets of bunk beds with each having a twin over double bed. Wi-Fi is provided. The grounds around Leanin K provide many spots for sitting and enjoying the outdoors. The large propane grill sits near the front door with wrought iron picnic table for 6. Just beyond the front patio sits a covered patio area with ample seating and ceiling fans to supply a nice breeze. On the poolside of the property are lounge chairs, wrought iron picnic tables and double wooden rocker. The hot tub is a perfect place to relax and unwind. Children will enjoy the built in kiddie pool that's just their size. Warming up to the outdoor fireplace is always a favorite in the evening. Pull up some chairs and enjoy roasting marshmallows for some yummy S'mores. The outdoor area is sure to be a hit. Just outside the fenced pool area are horseshoes and washer games as well as a playscape for the children. You can hop on the Sarayu Trail very near the Leanin K. This path cut through undeveloped areas of the 170 acres of Log Country Cove is just rugged enough to be a hiking trail. You will have the opportunity to walk over granite rocks and cross narrow creek beds. Wildlife scamper into the trees and bushes to make a fast get away. Mother Nature shares her beauty during each season so you'll never be disappointed with this adventure. Log Country Cove resort has a common area available for all guests' use. There you can participate in a fun game of sand volleyball, jump off the rope swing into the lake, have a picnic, fish and enjoy one of the beautiful Hill Country sunsets on the Sunset Pier that stretches out over Lake LBJ. Watercraft rentals are also available through the Boat Room conveniently located near the office and common area. You can chose a pontoon or ski boat, SeaDoo or non-motorized watercraft such as a canoe, kayak, stand-up paddle board, Go Boat or paddle board. Tubes and skiing equipment are available to rent as well. Your personal boats and jet skis are also welcome. While there are only a few boat slips, you can tie up your personal watercraft anywhere along the retaining wall and not have to trailer your boat every night. 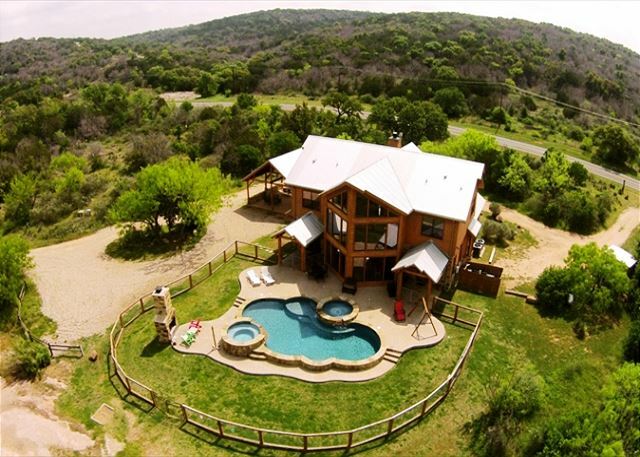 Leanin K is a gorgeous home sitting on 5 acres giving you plenty of privacy. Come see how this home has been creatively placed so that nature is disturbed as little as possible. You can spend time with just your group in the private pool, hot tub and other amenities or head down to the lake (about 1/2 a mile from the cabin) to mingle with other guests and enjoy the common area. As you can see, choosing Leanin K gives you the best of both worlds! I have been here before, but this time we decided to bring along other family members and they lived it so that we are planning our next vacation. The Leanin’ K was the ideal spot for our family! The house is comfortable with plenty of flexibility for a big group! Log Country Cove has great communication, and we enjoyed hiking on the trails! It did not impact our stay, but I do think the playscape should be repaired or removed. I didn’t let the game and kids play on it. We had a great time. Roomy enough for our family of 13. Very comfortable and accommodating. Wonderful 4 day stay to celebrate Christmas; thus was our second stay in Log Country Cove. 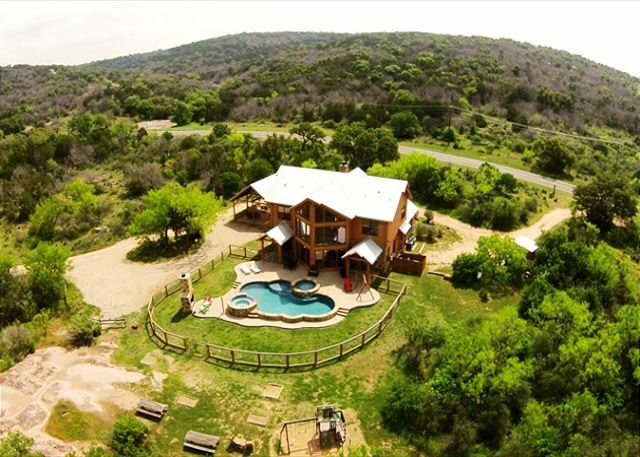 It’s so close to Austin but feels like a true getaway with the log cabins and beautiful lake. Dennis, we are so happy that you enjoyed your stay at the Leanin K. You are right about Log Country Cove feeling like a true getaway. We are looking forward to having you visit us for many years to come.